JACK of all trades Alan Robinson hails from Melbourne and grew up on tropical Magnetic Island in North Queensland. 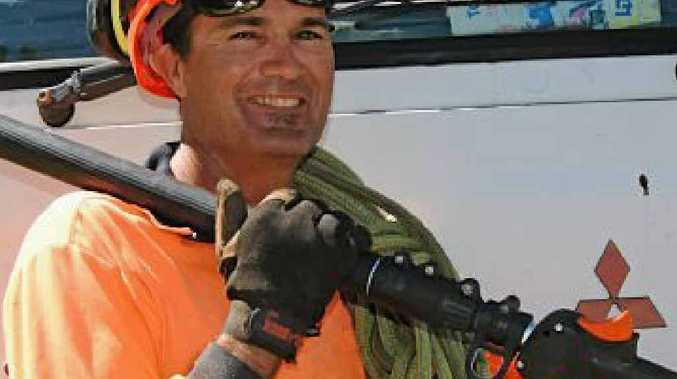 The 44-year-old Alan works for Sun City Trees in Townsville and drives a 1989 model Mitsubishi truck. "It is without a doubt the pride of the fleet and goes really well," he said. Alan gets to cut branches off trees and and is responsible for ensuring they don't hit things like clothes hoists when they hit terra firma. "Up in the trees we come across lots of nasties such as snakes and spiders but luckily I have never been bitten yet," he said. The strangest incident he had whilst up a tree was when confronted by an angry old magpie. All that aside the view is great from tall timber and Alan hopes that some of his old mates in Melbourne will see this when it is in Big Rigs.